Captured guns [Sherpur Cantonment, Kabul]. bl.uk > Online Gallery Home	> Online exhibitions	> Asia, Pacific and Africa Collections	> Captured guns [Sherpur Cantonment, Kabul]. 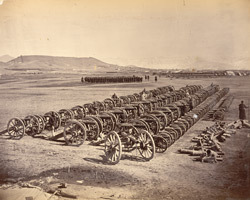 Photograph taken by John Burke in 1879, showing rows of captured Afghan field pieces drawn up inside the cantonment at Sherpur, situated a mile north of the city of Kabul. Following the killing of the British Resident Sir Louis Cavagnari and his mission at Kabul in September 1879, General Roberts and his forces entered the city and occupied the cantonment in October. Roberts was tasked with punishing those responsible for the death of Cavagnari, securing his force at Kabul and establishing a line of communication with British forces via the Khyber Pass. The cantonment, set up by the Amir Sher Ali as winter quarters for his troops, offered a secure and easily defendable position close to the city; it was large enough to accommodate the troops and provided easy access eastwards through the Khyber Pass towards Peshawar, northwards towards Kohistan and westwards into the Chardeh Plain. The views in this album concentrate on the topography of Kabul and military scenes during the British occupation of 1879-80. In 1878 John Burke accompanied British forces into Afghanistan for the duration of the Second Afghan War (1878-80), despite being rejected for the role of official photographer. He financed his trip by advance sales of his photographs 'illustrating the advance from Attock to Jellalabad'. Burke's Afghanistan photographs produced an important visual document of the people and the region where strategies of the Great Game (concerning the territorial rivalry between Britain and Russia) were played out. Coming to India as apothecary with the Royal Engineers, Burke turned professional photographer, in partnership at first with William Baker. Travelling widely in India, they were the main rivals to the better-known Bourne and Shepherd.